Personalized Round Cooler Bags Custom Printed in Bulk. Insulated, Inexpensive, Promotional, with Front Pocket and Back Mesh pocket. Hold up to 14 cans. Lowest prices in America. Wholesale Personalized Round Cooler Bags madeof sturdy Nylon 70D material and with PEVA lining for superior insulation. We also supply blank (not custom imprinted) bulk Round Cooler Bags: see thePrice Table below. 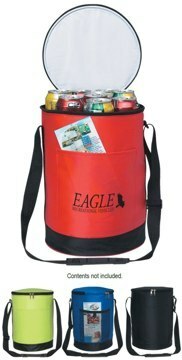 Lowest cost in USA and Canada for promotional Round Cooler Bags. American clients pay no taxes. Setup Charge: $45.00 per order. Extra imprint colors: not available. PRODUCTION TIME: 3-5 days after art approval; Blank (not personalized) Round Cooler Bags ship next day . COLORS AVAILABLE: Black, Royal Blue, Lime Green or Red. PACKAGING: 20 per carton @ 29 lbs.